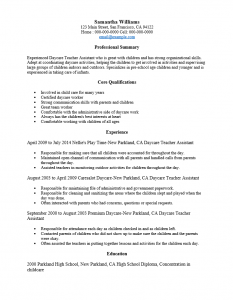 The Day Care Teacher Resume Template offers a constructive background for a teacher to build his or her resume upon. Each heading provides an area for teachers to deliver specific information about themselves. Day care teachers are responsible for the mental and physical well-being and growth of little children for a significant amount of time. In addition, they will have to function as part of an administrative team of childcare professionals. As such, in addition to the competition for teaching jobs in today’s market, day care teachers will also have to present a fair amount of information in one document. Arguably, the best way to accomplish these goals (amongst others) will be by conducting an organized and efficient search for a position. 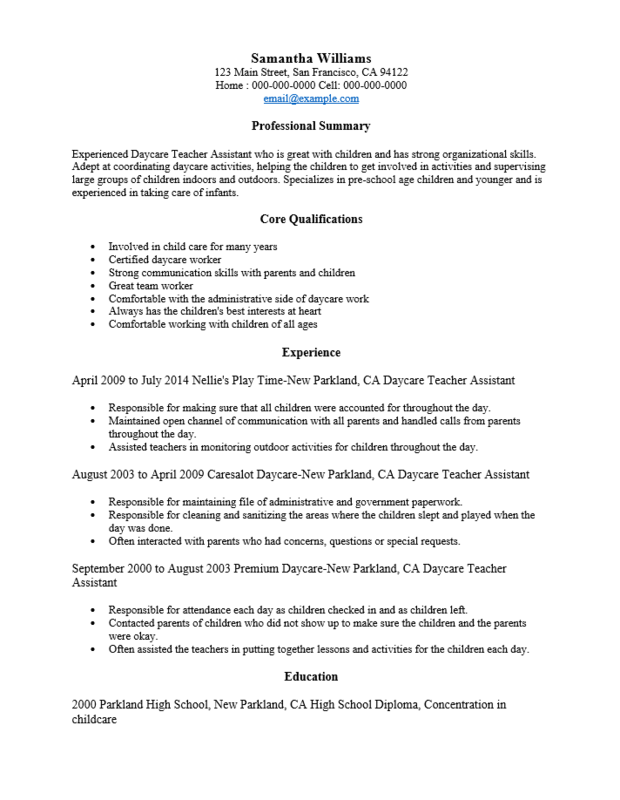 Once a template such as the day care teacher resume template is completed, one can send out a general resume to many employers or may use the same template as a basis for revised versions geared to a specific potential employer with relatively little effort. One should keep this in mind when initially composing the content of the template. It should be free from any errors and should convey an impressive and accurate impression of the job candidate. Step 1. The first few lines of every resume is reserved for your name and contact information. This should go at the top of the page. Its standard practice to center this information and add an effect to your name such as to bold it, underline it, or enlarge it. Step 2. The next section, “Professional Summary” is where you will give a few statements regarding your strengths. This should be roughly two to four statements. Step 3. The “Core Qualifications” section is a bullet list of your abilities as they relate to the job requirements. List theses skills and include any certification you attained. Step 4. The “Experience” section is a summary of your professional history. List all the places you worked. Make sure each entry includes the date range you were employed, the name of your employer, the location, and close each entry with a list of your accomplishments or duties there. Step 5. The “Education” section will be where you will give information regarding your degree. List the year you attained your degree, where you earned it, and the specific title of your degree. Give any supporting information directly below this.